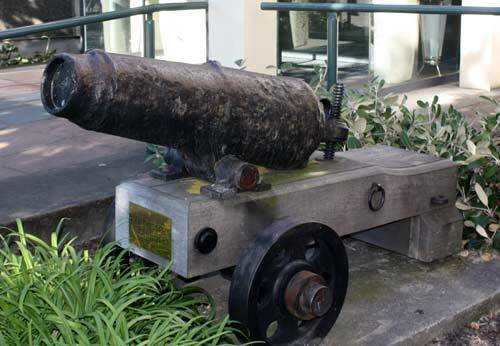 This cannon, known as Puhuriwhenua (earth shaker), sits outside the offices of the Marlborough District Council in the 2000s. According to his son, who recounted the story in the Marlborough Daily Times of 16 January 1901, whaler John (Jacky) Guard bought the cannon in Sydney, Australia, in 1833. He offered it to Nohorua, a relation of Te Rauparaha, as payment for the right to occupy Kākāpō Bay, where Guard was based in the 1830s. At some time when Nohorua was absent, the cannon was stolen by Captain John Blenkinsopp. He gave it to Te Rauparaha in exchange for access to wood and water for his ship, but later claimed that Te Rauparaha had signed away the Wairau plain in exchange for the cannon. The claim was not upheld by the colonial authorities. It has always been known as the Blenkinsopp cannon all the while it has been sited outside the Marlborough District Council offices, in at least two different places. It may be known as Puhuriwhenu as well, but it would have been better if you'd used both names. It's the freaking "Blenkinsopp Cannon" you fools. Don't change history to suit your own agenda!! In case I'm wrong though, prove it to me.